In this interior scene, three elegantly-clad women and a young girl await the piping-hot cup of tea being prepared in an imported Russian samovar. Wiles’ painting exhibits exactly what we’d expect from a portrait of Gilded Age America — an opulent decor with equally opulent sitters and leisure activities combined with a new brand of internationally-minded consumerism. Perhaps more interesting than the extravagant subjects and the imported ritual, is the artist’s study of light. In an age of plein aire and Impressionistic landscapes, canvases depicting domestic interiors always feel unusual — where did all the sunlight go? But Wiles’ painting, though not the expected Impressionist garden scene, is Impressionist indeed, but not just in its painterly style. At the heart of this work is a study of light. Here, Wiles examines how candle light, rather than natural light, illuminates a space. 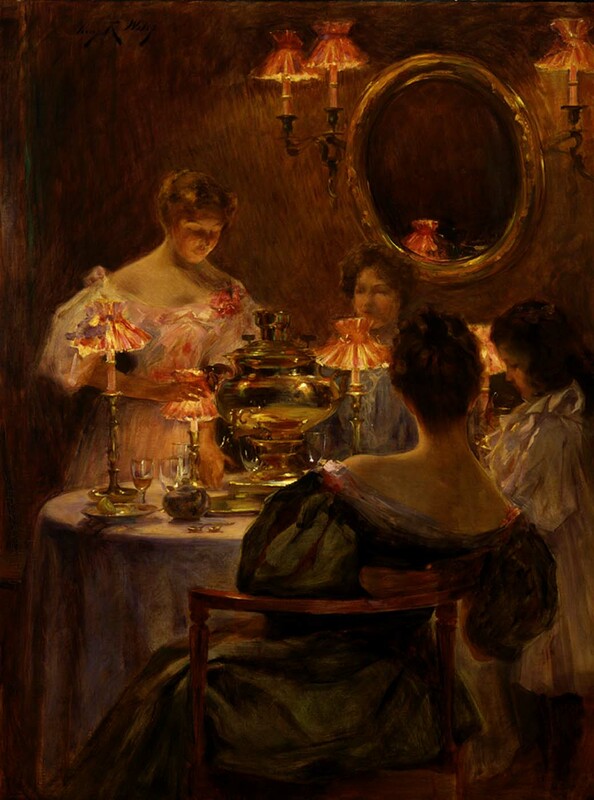 The warm but limited light from the lamps cast a soft glow on the porcelain-like skin of our feminine subjects while the cinched form and pink colouring of the shades seem to mimic the corseted bodies. The candle lamps are intrusive, their shades dominate the composition and obscure the figures so that we can’t ignore their role in setting the scene.